There is currently just the 1 ferry route running between Honduras and Roatan Island operated by 1 ferry company – Safe Way Maritime. The La Ceiba to Roatan ferry crossing operates weekly with a scheduled sailing duration from about 1 hour 20 minutes. 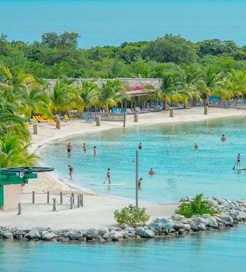 Whilst we’ve taken great care to ensure the information on this page is correct, as the frequency and duration of crossings on all routes can vary from time to time we’d advise that you get a live quote for current availability on this Honduras Roatan Island crossing between La Ceiba and Roatan. Honduras is a Central American country bordered by Guatemala to the west, El Salvador to the south and Nicaragua to the southeast. Like most nations on the continent, Honduras is scattered with ancient Maya ruins, with the most significant found in the city of Copan. It was one of the most important of all Maya civilisations which today, offers some spectacular architecture and fascinating hieroglyphics. However, Honduras’ most appealing feature is the wide selection of diving and snorkelling spots in pristine waters. Some of the best sites are close to the Bay Islands off the north coast, which are fringed by the second largest barrier reef in the world. They also boast immaculate beaches and lush, forested interiors. The Bay Islands are popular amongst tourists, so there are decent ferry services available. 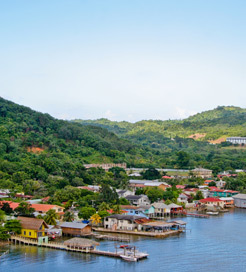 Multiple crossings are provided every day from the city of La Ceiba on the north coast to Roatan Island, the most visited of the archipelago.